Wade R. Loomis was born circa 1973. He was the son of Bob Loomis. Wade R. Loomis died on 25 July 2009 Wade R. Loomis, age 36, passed away after a brief illness on July 25, 2009. Wade was an avid outdoorsman, a fan of all things football, especially the Packers and was well-known for his witty sense of humor and his incredible thirst for knowledge. He was a devoted father to his 'honeybee ' Chloe, and cherished his wife, family, and friends. He is deeply missed by his wife, Stacy (Parrott) ; daughter, Chloe; mother, Joyce; sister, Meeghan (John Fox); and grandmother s, Margaret Loomis and Rita Marklein. He was also cherished by many aunts, uncles, cousins, and friends. He was preceded in death by his father, Bob; grandfathers, Roy Loomis and Bob Marklein; and aunt, June Loomis. A casual memorial gathering in honor of Wade will be held on Thursday, July 30, 2009, beginning at 2 p.m. at the VFW Post No. 8483, 5737 County Road CV in Madison. A brief ceremony will take place at 3 p.m. with a potluck to follow. Married Name before 1961 As of before 1961,her married name was Mears. Barbara Ann Foss was born on 1 December 1940. She was the daughter of Robert Foss. Barbara Ann Foss married John M. Mears, son of Andrew Martin Mears Sr. and Eleanor A. Massman, before 1961. Barbara Ann Foss died on 4 November 1961 at Wisconsin at age 20 John M and Barbara (Foss) Mears obituary. Timothy J. Mears was born on 3 April 1959. He was the son of Andrew Martin Mears Sr. and Eleanor A. Massman. 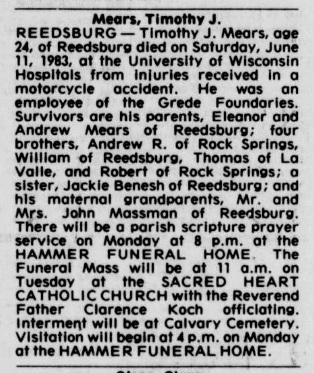 Timothy J. Mears died on 11 June 1983 at motorcycle accident, Wisconsin, at age 24 Timothy J Mears obituary. John Massman was born on 1 May 1890. He married Louise Krahn on 16 May 1917. John Massman died on 11 November 1984 at age 94. In May 1967 John and Louise (Krahn) Massman 60th wedding anniversary celebration. In May 1967 John and Louise (Krahn) Massman 50th wedding anniversary celebration. Patrick Sullivan was born in April 1861 at Wisconsin. He married Isabelle Riggins circa 1890. Married Name circa 1890 As of circa 1890,her married name was Sullivan. Isabelle Riggins was born in August 1865 at Missouri. She married Patrick Sullivan circa 1890. Isabelle Riggins had 4 with 3 living in June 1900 children. (?) Fitzgerald married Anna Sullivan, daughter of Patrick Sullivan and Isabelle Riggins. Joseph Sullivan married Fern (?). Joseph Sullivan was born in June 1892 at Arkansas also reported as Missouri. He was the son of Patrick Sullivan and Isabelle Riggins. Married Name Her married name was Sullivan. Fern (?) married Joseph Sullivan, son of Patrick Sullivan and Isabelle Riggins. Lizzie Sullivan was born in October 1898 at Arkansas. Married Name Her married name was Fitzgerald. Anna Sullivan married (?) Fitzgerald. Anna Sullivan was born on 3 September 1900 at St. Louis, Missouri. Clarence John Kraase was born on 18 July 1914 at Marshfield, Wood, Wisconsin. He was the son of Ernest A. Kraase and Emma Klumb. Clarence John Kraase married Catherine Mary Welch, daughter of Frank George Welch and Mary V. Mears, in November 1936 at Wisconsin. Clarence John Kraase died on 25 August 1991 at age 77. [S373] U.S. Federal Census 1940 U.S. Federal Census, by Ancestry.com, Year: 1940; Census Place: Milwaukee, Milwaukee, Wisconsin; Roll: T627_4560; Page: 8B; Enumeration District: 72-454. Thomas E. Smith was born on 18 May 1925 at Wisconsin. He married Mary Jane Welch, daughter of Frank George Welch and Mary V. Mears, on 10 April 1948. Thomas E. Smith died on 21 December 2014 at age 89 Thomas E. Smith, 89 of Marshfield died on Sunday, December 21, 2014 at Ministry St. Joseph's Hospital Palliative Care. Funeral services will be 10:30am Friday, December 26, 2014 at Rembs Funeral Home with Fr. Sam Martin officiating. Burial will be in Hillside Cemetery, Marshfield. Visitations will be from 9:30am Friday until time of service at Rembs Funeral Home. Tom was born in Marshfield to Edward and Olive (Tessmer) Smith and graduated from Marshfield High School in 1943. He was united in marriage to Mary J. Welch on April 10, 1948 in Bakerville. She died on February 6, 2009. He was employed at Smith Cartilage, Wisconsin Homes and drove cab in Marshfield. He later was employed at Karau's Grocery Store and retired from the Marshfield Clinic in the building services area. Tom loved to go camping, fishing, polka music at the Eagles Club and watch the Green Bay Packers. 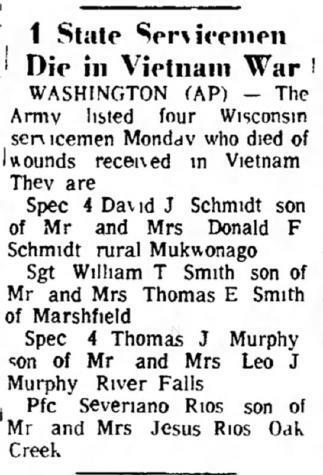 He is survived by his children, Mike (Mary Jo Hamilton) Smith of Baxter, MN, Connie Wiesemann of Marshfield, Jenny (Carl) Landowski of Scandinavia, Jim Smith of Marshfield, and Tammy (Kurt) Wallig; six grandchildren and 3 great grandchildren. Besides is parents, and wife Mary, he was preceded in death by Sgt. William Smith in Vietnam, two daughters Karen and Cheryl Smith, son-in-law Norbert Cahn, three brothers and one sister. Marshfield News Herald Dec 23 2014. He was buried after 21 December 2014 at Hillside Cemetery, Marshfield, Wood, Wisconsin. Regina Cecilia Hemmersbach married William J. Welch, son of Frank George Welch and Mary V. Mears. Regina Cecilia Hemmersbach was born on 12 January 1911 at Wisconsin. She died on 11 January 1992 at age 80. She was buried after 11 January 1992 at Gate of Heaven Cemetery, Marshfield, Wood, Wisconsin. [S373] U.S. Federal Census 1940 U.S. Federal Census, by Ancestry.com, Year: 1940; Census Place: Lincoln, Wood, Wisconsin; Roll: T627_4540; Page: 8A; Enumeration District: 71-13. Ernest A. Kraase married Emma Klumb. Married Name Her married name was Kraase. Emma Klumb married Ernest A. Kraase. Mary Ellen Kraase was the daughter of Clarence John Kraase and Catherine Mary Welch. Mary Ellen Kraase died before 1999. Married Name 12 January 1946 As of 12 January 1946,her married name was Welch. Dessa Darlene Hanne was born on 14 March 1923 at Illinois. She was the daughter of Wiley Hanne and Lulu Olson. Dessa Darlene Hanne married Frank George Welch, son of Frank George Welch and Mary V. Mears, on 12 January 1946 at Chicago, Cook, Illinois. Dessa Darlene Hanne died on 29 April 2014 at age 91 Funeral services to celebrate the life of Dessa D. Welch, 91, a resident of Mt. Pleasant, and a former resident of Davenport will be 1:30 p.m. Saturday, May 3, 2014, at the Halligan – McCabe –DeVries Funeral Home, 614 Main Street, downtown Davenport. Burial will be in Mt. Calvary Cemetery, Davenport. The family will greet friends Saturday at the funeral home from 12:30 p.m. until the time of service. Dessa died unexpectedly Tuesday, April 29, 2014, at the Henry County Health Center, in Mt. Pleasant following a brief illness. Dessa Darlene Welch was born March 14, 1923, in Kewanee, Illinois, a daughter of Wiley and Lulu (Olson) Hanne. She graduated from Rock Island High School. She was united in marriage to Francis G. “Frank” Welch on January 12, 1946 in Chicago, Illinois. He preceded her in death on November 8, 1990. In earlier years she had helped the war effort at the Rock Island Arsenal, she also had worked at the former Brach’s Candy Company, PhotoMat, Kahl Home and in home care helper, and the President River Boat mail room. Dessa was instrumental in establishing the Fairmount School for Handicapped Children and Adults. Dessa is survived by her daughters and son-in-law, Catherine “Cathy” Welch of Olds, Iowa, Marcia (Larry) Wilson of Leesburg, Florida; 2 grandchildren, 5 great-grandchildren, and 1 great-great-grandchild. In addition to her husband and parents, she was preceded in death by her daughter Jeanne Welch in 1970; a granddaughter Courtney Loftus; her brothers Kenny, Neal, Wayne, Dale, and Lenny; and her sister Irene. May they rest in peace. Wiley Hanne was born on 20 October 1889 at Kansas. He married Lulu Olson in 1911 at Illinois. Wiley Hanne died on 16 January 1939 at Illinois at age 49. Married Name 1911 As of 1911,her married name was Hanne. Lulu Olson married Wiley Hanne in 1911 at Illinois. Name Variation Jeanine I. Welch was also known as Jeanne. Jeanine I. Welch was born in 1950. She was the daughter of Frank George Welch and Dessa Darlene Hanne. Jeanine I. Welch died in 1970. Name Variation Kenneth Maynard Hanne was also known as Kenny. Kenneth Maynard Hanne was born on 25 May 1919 at Illinois. He was the son of Wiley Hanne and Lulu Olson. Kenneth Maynard Hanne died on 24 August 1998 at age 79. Name Variation Neil Vernon Hanne was also known as Neal. Neil Vernon Hanne was born on 28 May 1926 at Illinois. Neil Vernon Hanne died on 19 August 1993 at age 67. Wayne Hanne was born on 11 September 1921 at Illinois. Wayne Hanne died on 26 July 1987 at age 65. Dale W. Hanne was born circa 1917 at Illinois. Dale W. Hanne died before 2014. Lenny Hanne was the son of Wiley Hanne and Lulu Olson. Lenny Hanne died before 2014. Irene Hanne was born circa 1914 at Illinois. Irene Hanne died before 2014. Sargeant William T. Smith was born on 6 May 1949. He was the son of Thomas E. Smith and Mary Jane Welch. Sargeant William T. Smith died on 2 April 1970 at Vietnam at age 20. Cheryl Ellen Smith was born on 20 January 1958. She was the daughter of Thomas E. Smith and Mary Jane Welch. Cheryl Ellen Smith died on 22 November 1961 at age 3.